Typically, I do not feature polymer artists in Ornamental Elements, and leave my studio adventures/misadventures for What Are You Working on This Week. 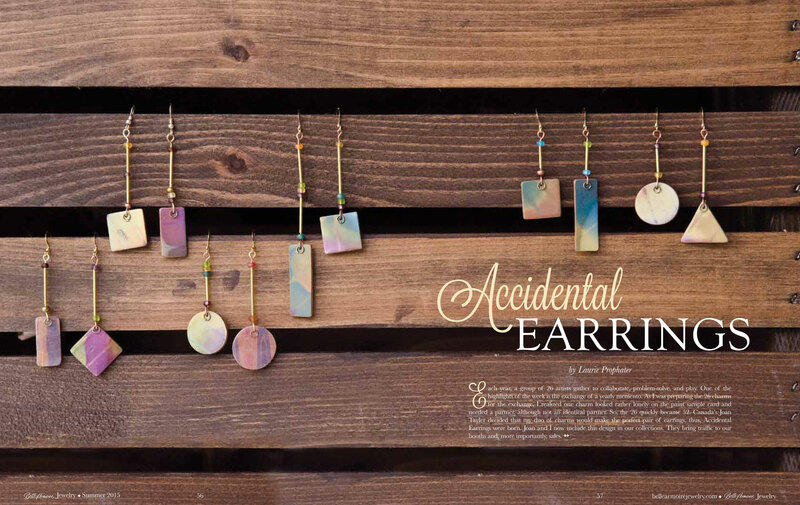 But, after a rather hectic year, I finally wrapped my creative mind around an article for the Summer issue of Belle Armoire Jewelry. I have to thank Joan Tayler for inspiring the article. We participated in an exchange last fall, and she turned my exchange charms into a pair of earrings…so clever. I have been tempted to write tutorials for digital media, but nothing beats the thrill of seeing your work published and on the newsstand at Barnes & Noble or Michaels. In February, Alice Stroppel, Julie Eakes. Meisha Barbee and I collaborated on a bangle project. On the surface the initial idea appeared to be simple, but each of us found at least one or two challenges before the bangles were completed. You will find an article about our challenges in the Fall issue of Belle Armoire Jewelry. Thank You! As always, this issue is full of inspiration in a variety of mediums….so many great ideas…never enough time to explore.